Theresa May has promised MPs a vote on delaying the UK’s departure from the EU or ruling out a no-deal Brexit, if they reject her deal next month. Mrs May made a statement to MPs about Brexit on Tuesday, amid the threat of a revolt by Remain-supporting ministers. 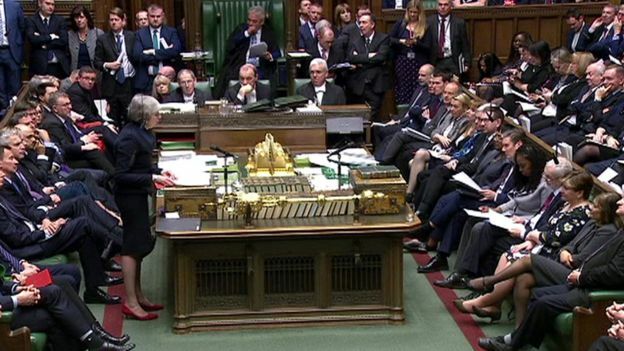 The PM has promised MPs a meaningful vote on her Brexit deal by 12 March. But Labour leader Jeremy Corbyn accused the prime minister of another “grotesquely reckless” Brexit delay. This entry was posted in News and Views and tagged Brexit, eu, Europe Union, Theresa May. Bookmark the permalink.